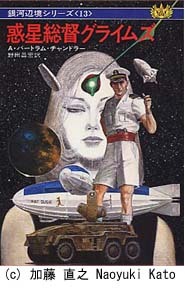 his first meeting with his readers in The Japanese Branch of the SF Family. ONE OF THE GREAT beauties of science fiction is that everybody involved, professional and amateur, is a member of a worldwide family. Oddly enough I had no idea that there was a flourishing Japanese branch of this family until very recently. That was just after, about three years ago, my New York agent did a deal with Hayakawa Shobo of Tokyo on my behalf. 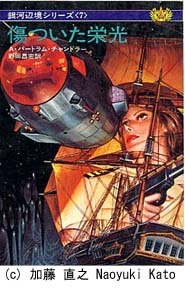 Hayakawa specialise in paperback translations of Occidental popular fiction, including SF. I was-and am-lucky in my translator. Thanks to him my Rim Worlds novels became very popular. There was fan mail, a Japanese literary award and, finally, an invitation to be guest-of-honour at last year’s All Japan SF Convention-Hinkon I-in Yokohama. It was shortly after I received this invitation that, like most Australian writers, I was perusing the advertisements in the magazine pages of the Saturday Australian to see what goodies were on offer to wordsmiths. Directly under the Australia Council’s announcement of Literary Fellowships I found an advertisement from the Australia-Japan Foundation offering Travel Grants to suitable applicants. I applied-and to my surprise and gratification was the recipient of a grant. 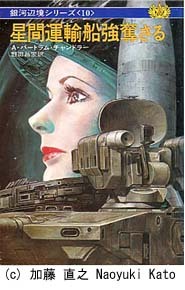 Thanks to it I was able to meet the Japanese members of the science fiction family-writers, editors, translators, artists and, of course, those without whom we would all be on the bread line, the Faithful Readers, the fans. My contact with Japanese fandom was made as soon as I arrived at the Tokyo airport; I faced a barrage of flash bulbs and was handed a bouquet of chrysanthemums. The day-my first in Japan for almost fifty years-started with sight-seeing, continued with a visit to one of the Tokyo fan clubs and culminated at a sukiyaki party at which my hosts were mainly professionals-my translator, editor and illustrator, Japanese SF writers and artists. Apart from language problems (although luckily most of those present spoke very good English) and the exotic food and surroundings, it could have been a science fiction family party anywhere in the world. The writers discussed work in progress and everybody joined in a quite heated argument as to whether or not the dinosaurs were warm blooded animals. With reference to that party-and to many similar parties afterwards-I was glad that my wife (who had experienced similar hospitality in Tokyo last year) had insisted that I learn to eat with chopsticks before leaving Sydney. Unfortunately she had not told me to learn how to sit Japanese style at a low table. Also-and this was something that I should have thought of myself-a pair of slip-on shoes would have been preferable to the lace-up variety. Not only shrines and restaurants but some offices and studios require the removal of outdoor footwear before entering. The main purpose of my trip to Japan was to be among those present at the Convention in Yokohama. It was very like conventions in the USA and Australia-the hucksters’ tables with SF books and comics, the panels, the quiz contest (for which I was asked to award the prizes), the speech by the guest-of-honour (heralded, in this case, by the playing of Waltzing Matilda over the public address system), the continual photographing of any celebrities present, the requests for autographs. Regarding this latter there was one very great similarity. Very often SF writers are unaware of any pirating of their works until some fan presents some dubious edition-in the West usually Israeli, Mexican or Hungarian - for inscription. In Yokohama the piracy that I was asked to autograph was Japanese. Mr Noda, who converts my works into that language for Hayakawa, told me that it was a very inferior translation. Of somewhat greater importance was the fact that I had never been paid for it. After the Convention I went walkabout. I’d booked on a package deal tour that allowed me considerable flexibility; in most of the cities visited my fans would be awaiting me to show me around. One thing I found very amusing; it is almost impossible for me to find my books in Sydney, even in the specialist bookshops. The limited number of American editions that come in very soon sell out. In practically every Japanese bookshop I visited my works were available in the Hayakawa edition. During one journey I found that the tour guide had brought along two of my novels for light reading during bus and train journeys. She was sitting next to an Australian girl whose interest was aroused by the bright cover of one of the books. She asked what it was. 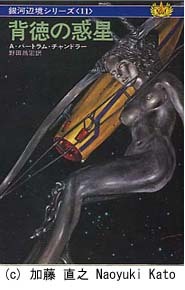 Then, in a loud voice, “And do you really have a Japanese science fiction writer called A. Bertram Chandler?” When she found that A. Bertram Chandler was sitting two seats behind she was somewhat embarrassed. On the same trip, my cassette recorder happening to be top stowage in my overnight bag, I decided to record the bus guide. These young ladies, attached to every tourist bus, feel obliged to talk almost nonstop, in Japanese, into their microphones. When they run out of anything to say they sing Japanese folk songs. As invariably everything is over-amplified, foreign tourists find it all rather wearing. Anyhow she-the bus guide-noticed what I was doing and asked the tour guide who and what I was. 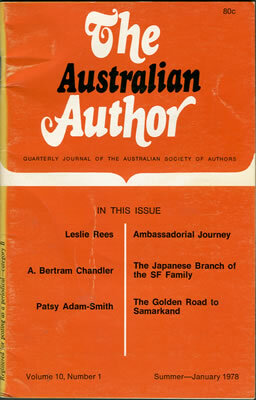 She was told that I was an Australian writer collecting material. She asked what Australian writer. Then it turned out that she, too, was a Faithful Reader and immediately requested my autograph. I forgave her then for the over-loud monologue and folk songs. The autographings along the way were frequent enough but it was the organised book-signing parties that were really wearing. They were all very well organised. I’d sit at a table with an interpreter- usually a pretty girl-beside me and then for two solid hours the Faithful Readers, bearing huge, gilt-edged autograph cards and copies of my books, would file past. As most of my Japanese readers are students and as most Japanese students wear what is almost a naval uniform I felt that I should be back in uniform myself. It was like signing all the Discharges at the half yearly Change of Articles. As on those past occasions my writing got steadily worse and worse. Mostly I’d just inscribe To So-and-So-San with best wishes . . . but now and again I’d make some variation. On three successive book signings there was a Seiko, and each time it was a young lady. They all got To Seiko-San, a girl to watch! I think that this was one of the rare puns capable of translation. And then there was the girl in Takamatsu who insisted that I use the literal translation of her name- Star River. She got Long may she shine! After each signing I’d be entertained to an authentic Japanese dinner. One such in Fukuoka City sticks in my memory. (It didn’t quite stick in my gullet although it was a near thing.) It was in an establishment specialising in sushi, which is raw fish, carved into bite-sized pieces which are dipped into a mixture of soy sauce and mustard before being eaten. In this place the fish were swimming in tanks so that the diners could select their victims. Scooped out in a net, the fish are knocked on the head and then artistically sliced and served on a platter. I was wielding my chopsticks enthusiastically when my attention was drawn to the fact that the fish had not been killed but only stunned. It had recovered consciousness. Enough musculature had been left on the skeleton for it to twitch its fins and tail while it regarded its persecutors with a glazed but reproachful eye . . I was told that there are some sushi restaurants in Japan where the fish are carved so skilfully that when the diners are quite finished the skeletons, with the bare essentials still in place, are put back into the water, where they swim away. But-officially, anyhow-I was more concerned with food for the mind than food for the body. I found that Western fiction of all kinds is enormously popular in Japan, publishing houses such as Hayakawa Shobo employing many translators. Comic books, by Japanese artists, are also very popular and seem to be the most common form of reading matter for train journeys. Some are crudely pornographic, others of very high quality. Among these latter are those by Osamu Tezuka, who, although an MD, found fame and some degree of fortune as a cartoonist and animated film producer. I was invited to a showing of Japanese animated cartoons at the major TV station in Tokyo which was, actually, a history of that art form in Japan. Even some of the very early films were truly beautiful and the later ones, mainly from Dr Tezuka’s studio, were superb. The programme ended with an American animated cartoon with Japanese dialogue dubbed in. It, with its horridly cute anthropomorphized bugs, was shockingly ugly and crude after what had gone before. In conclusion, I must say that the trip was well worthwhile. It enabled my Japanese readers to meet me and-of greater importance, perhaps-enabled me to meet my Japanese readers. I know now the public for whom I am working in that country, people whose ages range from sixteen to forty-five, students of both sexes, professional men and women. I liked them all. I hope that they liked me. And all the time there was the realisation that we are all members, differences of race and language notwithstanding, of one big family.